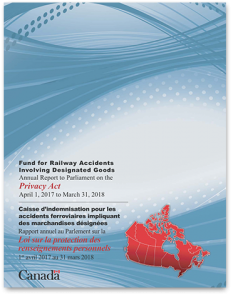 Since February 21, 2018, the Fund for Railway Accidents Involving Designated Goods (FRAIDG) is subject to the Access to Information Act and to the Privacy Act. These acts provide Canadian citizens, permanent residents or any person (or entity) present in Canada the legal right to obtain information, in any form, that is under the control of a government institution. The general purpose of these acts is to make government more open and transparent and to allow citizens to more fully participate in the democratic process. 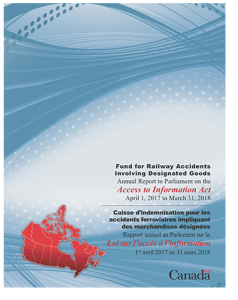 A monthly list of summaries of Completed access to information requests processed by the Fund for Railway Accidents Involving Designated Goods (FRAIDG). These pages will be updated every three months to include information from the previous quarter. The Access to Information Act gives individuals a right to access records under the control of a federal government institution in accordance with the principles that government information should be available to the public, that necessary exceptions to the right of access should be limited and specific and that decision on the disclosure of government information should be reviewed independently of government. You may make a request under the Access to Information Act for information under the control of the Fund for Railway Accidents Involving Designated Goods. The Privacy Act protects the privacy of individuals with respect to personal information about themselves held by a government institution and provides individuals with a right to access and request correction to this information. In accordance with section 7 of the Privacy Act personal information can only be used in accordance with the purpose for which the information was collected or for a use consistent with that purpose.